He ran down the steps again to the river and scooped handfuls of water and lashed them into his face, but even that didn’t do, he tugged off his shirt with his wet hands and splashed his chest all over with water, and when he came back up, he held the wet shirt in his wet hands and let water run down his waist and splatter and wet his pants. Hrabal's comedy, then, is complexly paradoxical. Holding in balance limitless desire and limited satisfaction, it is both rebellious and fatalistic, restless and wise... 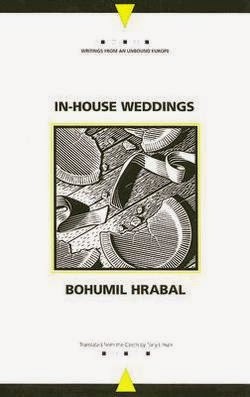 It is a comedy of blockage, of displacement, entrapment, cancellation... Hrabal, in Freud's terms, is a great humorist. And a great writer. In terms of his available works in English, I still much prefer Too Loud A Solitude, and Closely Observed Trains but in this really rather delightful novel are all of the seeds of the narratives from both, clearly plucked from his own life experiences. I can’t think of another writer whose books I enjoy on as many levels, and if only he’d travelled past his Bohemian horizons, I’d be willing to bet his works would be as ubiquitous as those of his more widely distributed European contemporaries.